St Peter's Church, Hammersmith, is an Anglican church, situated on Black Lion Lane, and is the oldest church in Hammersmith. The architect was Edward Lapidge, born in Hampton Wick in 1793. His father, Samuel Lapidge, was a landscape gardener working at Hampton Court as an assistant to Lancelot (Capability) Brown. In 1823, Edward Lapidge was finalist in a competition to design a set of new buildings for King’s College, Cambridge. In 1835 he was a finalist again in a competition to design the Fitzwilliam Museum. His completed works include Hampton Wick Church (1829), the rebuilding of Hampton Church (1830), St Mary’s Church, Putney (1836) and the enlargement of Fulham Church (1839). In 1852 he designed Reigate Police Station. He exhibited at the Royal Academy between 1808 and 1850. He died in 1860 and is buried at Hampton Wick Church. 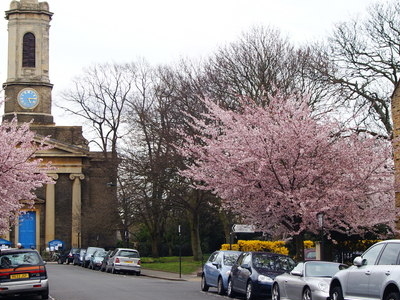 Here's the our members favorite photos of "Churches near Hammersmith and Fulham". Upload your photo of St Peter's Church!